Wouldn’t it be great to have the Midas touch and everything that you touched turned to gold right before your eyes? King Midas might have thought it more of a curse than a blessing, but this slots online game shows that it doesn’t have to be a bad thing. All that glistens certainly is gold here, and you will get the chance to walk away with some golden treats. You might even end up winning worth your weight in it! Big Time Gaming is probably the best team of developers to create a gold-themed game as their portfolio of games is one of the most successful out there. This Australian company is so well-versed in online casino gaming, that they have managed to build up a substantial reputation for themselves even though they have quite a small portfolio of games compared to other developers. Learn more about online slot games like Faeries Fortune. The whole design of Gold is exactly how you would expect – extremely golden! In fact, the background music sounds suspicious background is made up of sparkling gold bars and glittering golden lights. You might have to shield your eyes from all the glare! 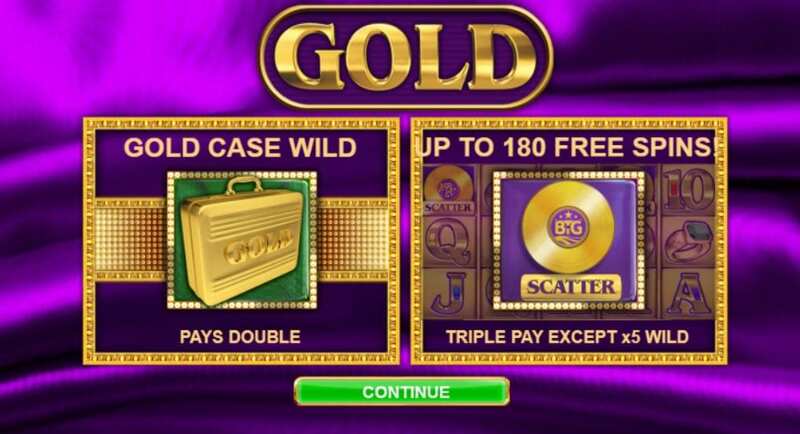 The game’s title logo is in a purple banner above the game board and the title “Gold” keeps on spinning into view. Here's a guide that compiles the best UK video slot! The game board is right in front of the brash golden background and is split into five reels, each with three symbols on. The symbols on the reels look very sophisticated and are all made out of gold. Even the lower-valued letters and numbers! The symbols that you need to try and match up, though, are the picture icons, which include swanky cars, gold rings, and flash wrist watches. The more symbols you can match up along the pay lines, the more you will stand to win. That’s not all, though, as the slot game also features some bonus symbols that make the game a whole lot more exciting. WILD SYMBOLS – Watch out for the golden briefcases as they are the Wild symbols in the game. These will replace any of the symbols on the board, all except the Scatter icon. They make it easier to make winning matches and can also multiply your wins. SCATTER SYMBOL – The Scatter symbol in this game looks like a golden record. You won’t miss it, though, as it is clearly marked with the word “Scatter”. This not only activates some free spins, but it will also multiply your initial stake. If you are lucky, you could win up to 180 free goes!